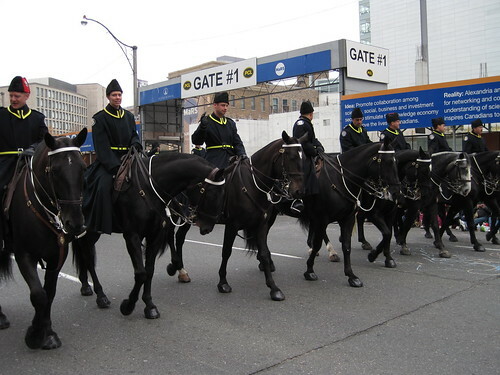 As I mentioned in my review this afternoon of today's Toronto Santa Claus Parade, I've now gone to six in a row. Prior to that, I missed at least fifteen, the years between my childhood and fatherhood. The parades I've witnessed these past six years include all new floats and a modern flare, but there are certain constants that link the parades of my youth with these recent parades. Here are seven links to the past. Note: All pictures were taken by yours truly earlier today and can be found in my Flickr photoset. 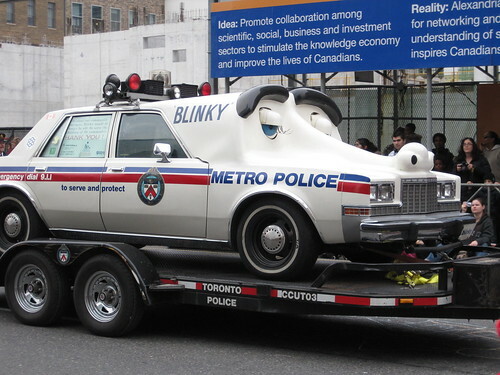 Blinky was always there when I was a kid and I'm glad he's still making the rounds. I'm also glad he's looking better after a brief rough patch. I always felt the Upside-Down Clowns were kind of creepy, but even today they were blowing the kids' minds. Did you know Elmer's been asking kids to safen up since 1947? It's true, you can look it up. Although most outfits have been updated since the 80s, you can always spot the vintage old school costumes. 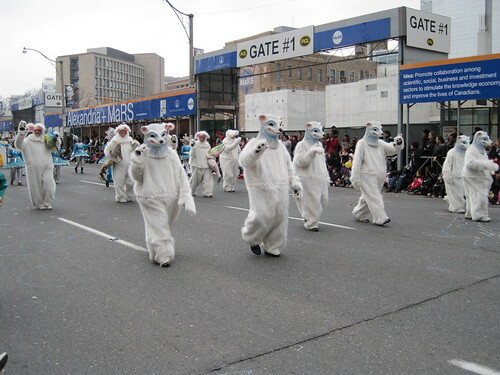 In addition to the above upside-down clowns and the below polar bears, I spotted retro tigers, skunks and bears. 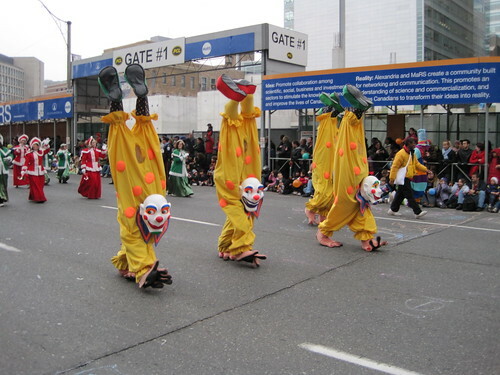 I always feel sorry for the poor souls dressed as clowns and following the horses along the parade route with a shovel, broom and garbage can. 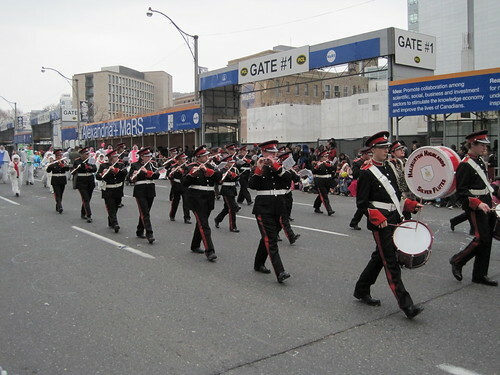 A staple of a good Santa Claus Parade will always be a massive quantity of marching bands. 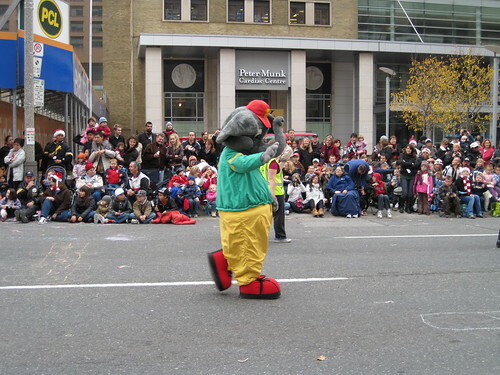 He's the guest of honour, the final float and he's guaranteed to get the biggest cheer. 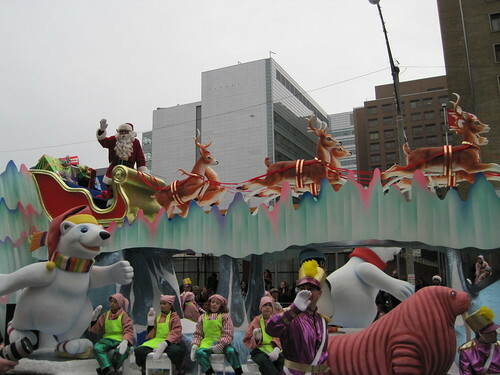 From the first parade to the 105th parade, Santa Claus was there. How early did you guys get there to get a seat on the curb? 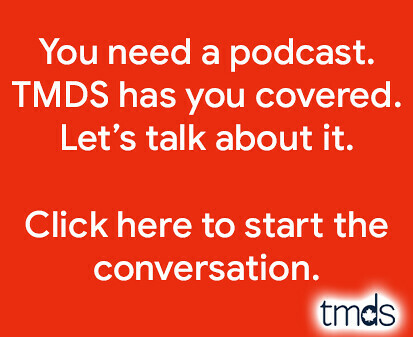 We're there for 11am to get sweet seats without the hassle.